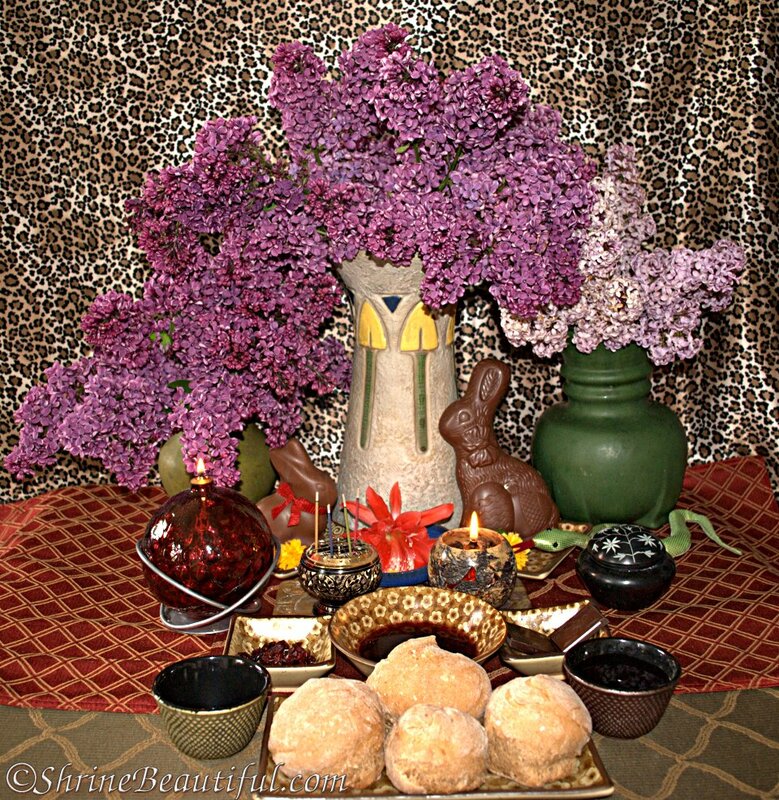 Shrines are a big deal within the Pagan community at large. There are long threads filled with pictures of shrines, and there are websites dedicated to pictures of shrines. But what exactly does a Kemetic shrine entail? This answer can be somewhat difficult to answer because there were two different types of shrines in antiquity. You had the inner-shrine of temples and you had shrines that were in regular people’s houses. 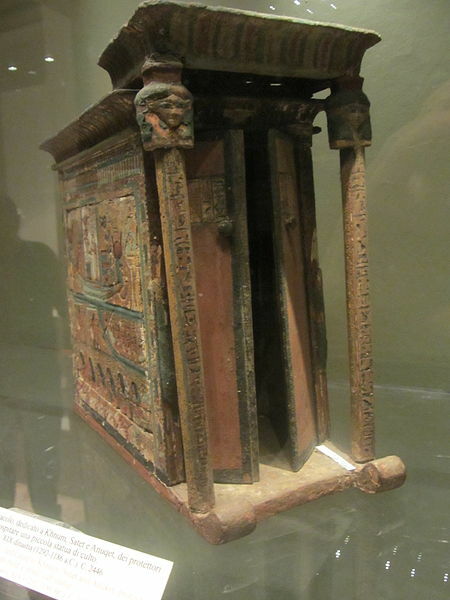 It is a combination of both of these shrines (what little we know about both) that tends to influence how Kemetics set up shrines in their modern practices. 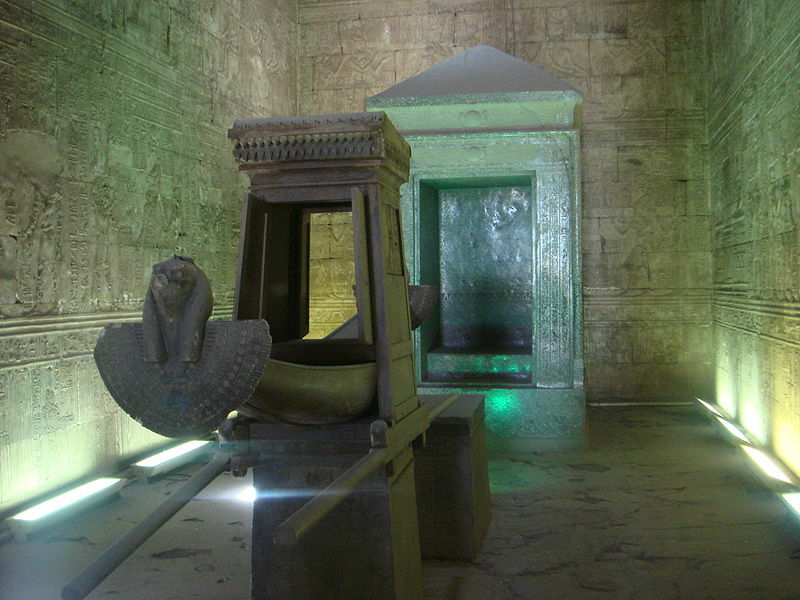 Temple shrines in antiquity were typically located in the very back of the temples, in a very dark room. The idea behind temple setup in ancient times was that you were moving from profane to sacred time. As you would go further into the temple, there would be less and less light, and often times the floor would drop down in levels as well. Finally, in the room where the shrine was located, there would be a box with doors that rested on a raised area in the floor. This raised area represented the ben-ben, or primordial mound that occurred during zep tepi (the first time). The same way that the Creator deity would rise out of the waters of Nun to create all life, this shrine that encases the open deity icon is too rising out of the Nun to bring forth creation. It’s basically heka in action. Inside of the closed off box (which I often call a kar shrine) would be the deity’s open icon. If what I’ve read can be trusted, usually this room didn’t have a whole lot in it. The deity would be given offerings of incense, clothing, jewels, flowers, etc. And while the offerings would be in there for a time, once everything was reverted, the main items in the room was the kar shrine and perhaps a table. So all in all, it was very sparse. Its more difficult to ascertain what types of shrines average people have because there aren’t many ‘average Joe’ types of houses left for us to learn from. Most of what I’ve read indicates that most shrines were inset into the wall where people would leave small offerings and have a few small deity icons. Mind you, the more wealthy the person, the more elaborate the shrine would likely be. It’s also likely that many people had murals or motifs on the wall to represent their gods as well- which could also be a type of shrine in its own way. Kemetic shrines in the modern era run the gamut. Stylistics and needed items for setting up a shrine are largely influenced by the type of Kemeticism you practice (KO vs independent vs recon etc), the resources and space available to you, and personal taste. Some shrines are indoors, some are outdoors, some are very orderly, some are very chaotic and spontaneous. It is largely a situation of “anything goes”. That’s really it. These are the most common items that are used or ‘necessary’ in a shrine. You will usually have a focal point, such as a deity statue or perhaps an icon of ma’at. And then you will have dishes that you can place offerings and libations in or on. Here are some examples of a variety of shrines that will help to illustrate the wide variety that is out there (for shrines that are not mine, you can click the images to visit the original location of the images used). But so many of the shrines I see have so much more stuff on them! That is because, at its core, a shrine is a place of devotion to a deity or a path. Therefore, lots of people like to put items on their shrines that the gods specifically like or request to have placed on there. Many people like to keep things such as stones, sacred jewelry, candles and other items on their shrines because it helps them to focus on their deity, because their deity requested it, or because it makes them happy. 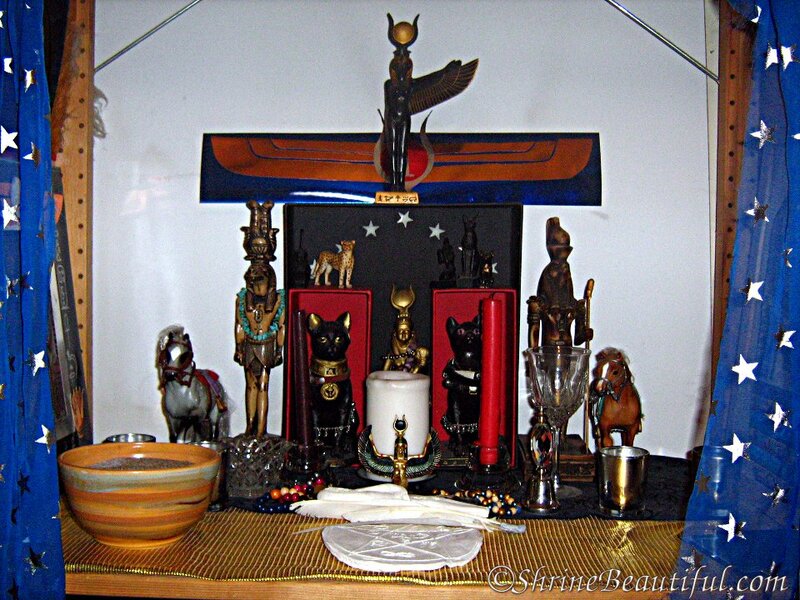 Don’t be afraid to experiment with shrine layout and contents to figure out what works best for you. I often cycle through multiple items throughout the year to keep the shrine layout varied and interesting. There is nothing wrong with switching things up regularly. Also, don’t let fancy or large shrines scare you from creating your own! Shrines don’t have to be big or expensive to be awesome. 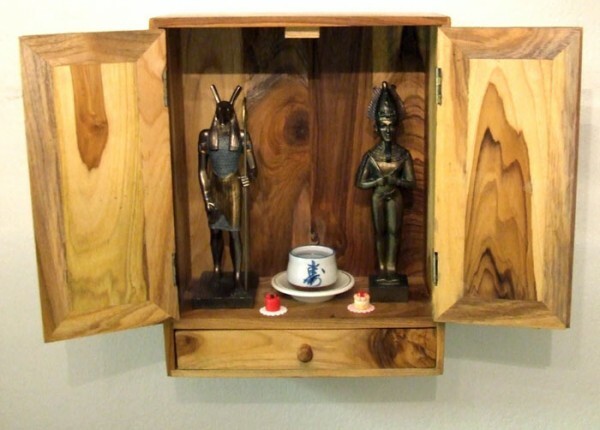 Some of my best shrines were simply fabric covered boxes with a statue and a cup sitting on top of them. This isn’t about keeping up with the Jones’. It’s about celebrating your gods and showing your devotion to them. Many people like to create travel shrines as well- mini-shrines that they can take with them while traveling so that they can continue with daily rites or devotion to their deities. 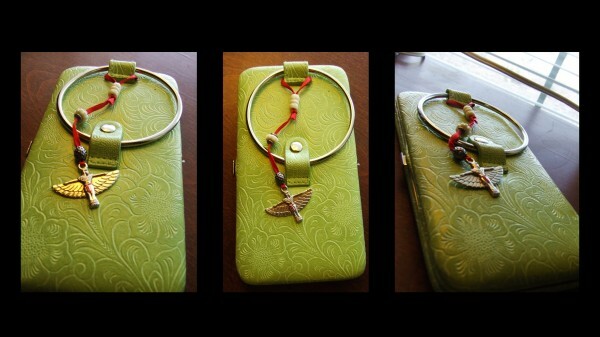 Another possibility would be to use devotional jewelry that you wear as a form of a portable shrine. 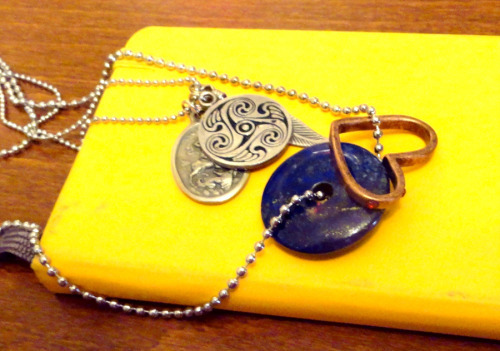 Devotional jewelry is great because you can hide it away easily, but yet can be taken just about everywhere with you. You can use devotional jewelry in the same fashion as a normal shrine- you can hold the item and say your prayers into the jewelry, you can transfer your life force or ka into the jewelry by holding onto it as well. If you’re interested in giving offerings via the jewelry, you can technically offer your meals to the gods while you wear the jewelry, or you could set the jewelry on the table and place offerings in front of it the same way you would a deity icon. A new trend in shrine creation is the use of the Internet to house your shrine. This trend is largely seen on Tumblr, where many devotees will collect images and snippets of various things that remind them of their god or path. I think this is a great way to show the many aspects that a deity can have through photos, music, words, and other items that may not necessarily come through in various knick knacks or traditional iconography. Additionally, this style of shrine is very low cost and can be maintained by just about anyone. I personally consider my WP and my Tumblr accounts as a form of online devotion to my gods, and therefore shrines in some respects. I use them both to help spread knowledge and help others who are new to the Kemetic path- which to me, is about as devotional as it gets. So don’t be afraid to think outside of the box and explore other ways that you can utilize new and interesting methods and modalities as shrine spaces. Why should we have shrines? While not necessary in the least bit, shrines are very useful at bringing us closer to the gods and our faith. 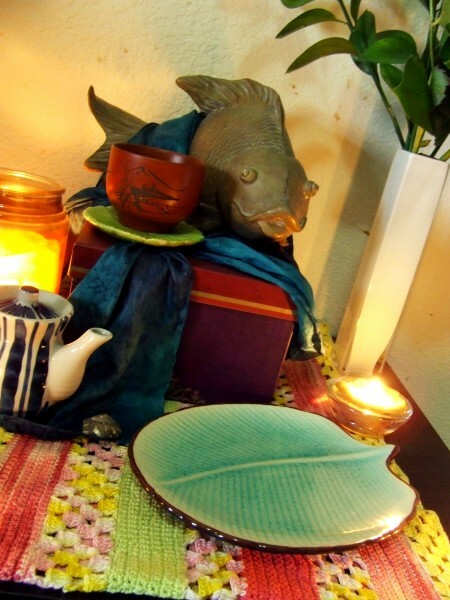 Shrines allow us to have a sacred, personal meeting space for our gods, and can help to foster relationship growth within our practice and religion. It’s my personal belief that you shouldn’t feel pressured to have a shrine, as it isn’t necessarily the focus of Kemeticism, however I would recommend exploring the idea at some point along your religious path. See the master list for this KRT topic by clicking here. Thank you for this! I’ve always wanted a shrine or altar in my living space but it’s not feasible at the moment. The E-shrine is an excellent idea and one that I may pursue.